The broad list of commercial applications for multi-walled carbon nanotubes (MWCNT) can be further expanded with the addition of various surface chemistry modifications. For example, standard commercial grade MWCNT (C-grade) can be carboxylated (COOH) or nitrogen-doped (N-doped) to suite specific utilities. We previously reported dose-dependent expansions of cardiac ischemia/reperfusion (I/R) injury, 24 h after intratracheal instillation of C-grade, COOH, or N-doped MWCNT in mice. Here, we have tested the hypothesis that airway exposure to MWCNT perturbs cardiovascular adenosinergic signaling, which could contribute to exacerbation of cardiac I/R injury. 100 µL of Vehicle or identical suspension volumes containing 100 µg of C-grade, COOH, or N-doped MWCNT were instilled into the trachea of CD-1 ICR mice. 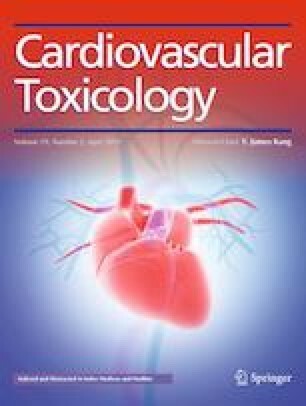 1 day later, we measured cyclic adenosine monophosphate (cAMP) concentrations in cardiac tissue and evaluated arterial adenosinergic smooth muscle signaling mechanisms related to nitric oxide synthase (NOS) and cyclooxygenase (COX) in isolated aortic tissue. We also verified cardiac I/R injury expansion and examined both lung histology and bronchoalveolar lavage fluid cellularity in MWCNT exposed mice. Myocardial cAMP concentrations were reduced (p < 0.05) in the C-grade group by 17.4% and N-doped group by 13.7% compared to the Vehicle group. Curve fits to aortic ring 2-Cl-Adenosine concentration responses were significantly greater in the MWCNT groups vs. the Vehicle group. Aortic constrictor responses were more pronounced with NOS inhibition and were abolished with COX inhibition. These findings indicate that addition of functional chemical moieties on the surface of MWCNT may alter the biological responses to exposure by influencing cardiovascular adenosinergic signaling and promoting cardiac injury. We would like to thank Cathy Stang and Alvin Tsang for help with tissue collection and vascular data acquisition. We thank Dr. Walter Klein of ONY, Inc. for donating the Infasurf™, Dr. Benjamin Harrison and Dr. Richard Czerw of NanoTechLabs, Inc. for providing the MWCNT used in this study. The conclusions reported in the manuscript are those of the authors and do not necessarily reflect those of the National Institute of Environment Health Sciences, East Carolina University, Bellarmine University, or the University of Colorado at Denver. This research was supported by East Carolina University and funded through the National Institutes of Environmental Health Sciences: NIH R01 ES016246 (CJW) and U19 ES019525 (JMB and CJW). The authors report no conflicts of interests related to the research reported in this manuscript. All applicable international, national, and/or institutional guidelines for the care and use of animals were followed. All procedures performed in studies involving animals were approved and in accordance with the ethical standards of the Institutional Animal Care and Use Committee at East Carolina University (Greenville, NC, USA).